There are certain features that every home has, and we don’t often spend much time thinking about them. We open doors without wondering if a wheelchair could fit through it. We go up and down stairs without thinking about the potential hazard they present. But everyday home features like stairs and standard tubs or showers can actually pose a physical danger to senior citizens. Here are 5 simple home upgrades that can make a home safer for a senior citizen with more limited physical capabilities. 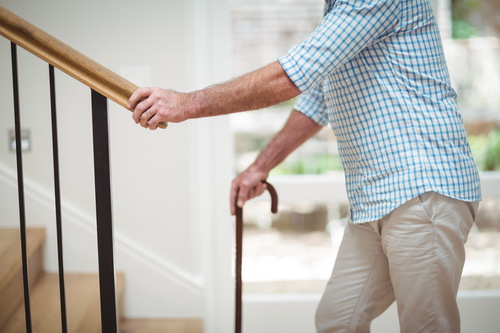 Stairs are arguably the most common issue in a home for those with limited mobility—be it senior citizens, disabled individuals, or even someone with a temporary injury. While you may have previously bounded up the stairs with ease, as you age, you might find that the stairs are a genuine obstacle to tackle in your own home. Stairs lifts can make your life so much simpler if you struggle with ascending or descending the stairs. Simply sit in the seat, and it will slowly and gently carry you to the next floor. You don’t have to worry about taking a tumble ever again. For many senior citizens, the simple act of getting into and out of a chair—especially one with a deep or very soft seat—can be a major struggle. You might require help, or if no help is available, you may end up straining yourself trying to stand up. Lift chairs are designed to tilt forward on a sturdy, motorized support system, allowing you to more easily sit down and settle back. Then, when you’re ready to get up, you can simply press a button, and the chair will tilt you forward so that you can comfortably get your feet on the ground unassisted. The bathroom is often one of the most dangerous places in a home for senior citizens. Things get slick and wet, posing a slipping hazard for even the most able-bodied individual. But the bathtub can be especially troublesome for the elderly, as climbing in and out of a slick tub can be quite difficult. Walk-in tubs provide a much safer way for these individuals to enjoy a relaxing bath. These home installations have a small door built into the side of the tub, so the person can step inside without having to climb over the edge of the tub. When the bath is empty again, they can open the door and step right back out. While shower stalls don’t require you to climb over a raised edge to get in, they pose a different problem for senior citizens: First, standing for long enough to thoroughly wash themselves is difficult for some individuals. Secondly, a shower stall is still a major slipping hazard. Soap runs off your body and down around your feet, along with the shower water, making the floor extra slippery. Shower seats are an excellent solution for those who have a hard time showering safely on their own. They can sit to wash themselves, and if they have a handheld showerhead attachment, they can rinse themselves off in the chair as well. Some shower stalls have a built-in seat, but if yours doesn’t, you can purchase one and install it in your shower easily. Hand rails are a small thing to install, but they can make the home a much safer place for you, or for any elderly friends and family members who come to visit. While some types of accessibility home improvements might require extensive renovations—like widening hallways and doorways to accommodate a wheelchair—there are so many simply changes you can make in your home to create a safer living environment for those with more limited physical capabilities. Whether you need to make changes in your home to adjust to your body’s changing needs, or you want to make it a more accessible place for your elderly loved ones, try starting with the 5 adjustments mentioned above.